Here is a very early California built custom ‘dave moulton.’ Built in January 1981 while I was working for Masi, having just moved there three months earlier. My thanks to owner Ken Meyers for these pictures. Ken is the original owner, and this 56 cm. frame still has the original paint. Built in Reynolds 531 tubing, this one definitely shows my English heritage. 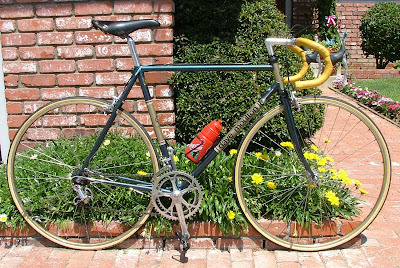 The contrasting color on the head tube and panels on the seat and down tubes was typical of English frames from the 1970s. The World Championship rainbow bands that edge the panels were from a small supply I had brought with me when I moved to the US just two years earlier. The “Union Jack” British flag decals were cut from the Masi Gran Criterium decals that had flags of several nations. The concave seat stay caps, made by brazing in place an off-cut of head tube would become typical of my custom frames. 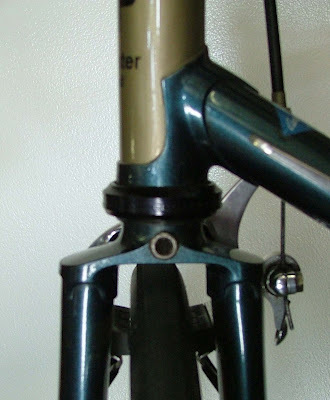 Also used on many frames that followed was the slim-line fork crown. Investment cast in Italy by Microfusioni, (The company that cast Cinelli crowns and BB shells.) and imported by the British company, Saba. 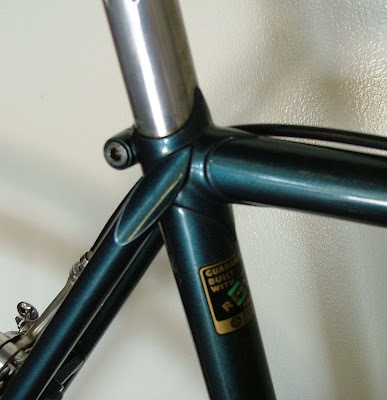 There is no engraving on the fork crown and bottom bracket of these 1981 custom frames, that started the following year in 1982 when I started building my own frames full time. This frame was built with “Henry James” lugs, hand cut at the head tube to the shape you see here. Wow! Now that's a beauty! I know you built about 3000 Fusos, how many customs of this caliber were produced? This bike looks practically unridden to boot. Interesting how the asthetic details compliment the Campy Aniversary Groupo so nicely, even though the frame was built and painted perhaps six years before Campy broght it to market. I want one! May the Gods of eBay shine down... a 59cm with a 57 top tube please.